Wondering what we can do for you? Ask us to check out your site and make suggestions on how to drive more traffic and leads for your business. Beat Medical is an Australian medical recruitment agency specialising in placing doctors in jobs across Australia and Oceania. The aim for their search marketing campaign is to increase their exposure to doctors searching for jobs online. 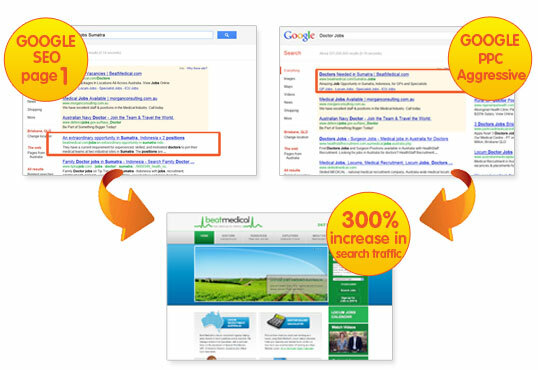 MooMu Media has been Beat Medical’s search marketing provider since 2009. Starting as Beat Medical’s SEO provider, we have since been awarded management of their Pay Per Click campaigns (Facebook, Yahoo and Google) as well as advising on social media. MooMu Media works with Beat Medical in a number of ways; placing paid advertisements in search results to bring immediate and qualified prospects; optimising their website to increase natural search engine rankings and placing ads on relevant sites (including Facebook) to target new prospects and increase branding. Work began in December 2009, with a Pay Per Click campaign instantly delivering visits from doctors who were actively searching for new jobs online. SEO work commenced in January 2010, focusing on onsite optimisation and a strong offsite linking campaign. In May 2010, the website was transferred to a new CMS and a new domain. Thanks to MooMu Media’s assistance, the transfer was made in a SEO friendly manner, maintaining natural search traffic during and immediately after the transition. BeatParamedics.com.au earned first page rankings within 3 months of going live. Search traffic continues to constitute over 75% of Beat Medical’s total site traffic.
" The results have been astounding and we count MooMu Media as an integral part of our overall marketing strategy.” "